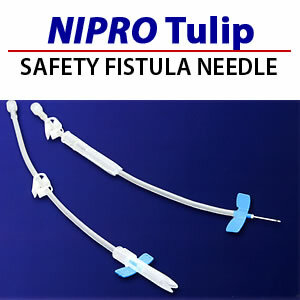 Below are highlights of the proper removal of the SafeTouch Tulip Safety Fistula Needle. To Withdraw the AVF needle from the patient, pull needle back slightly to expose cannulation site. Slide TULIP needle protector forward until three "petals" of the TULIP needle protector tip are positioned over the flattened wings. Simultaneously pull on tubing while pushing TULIP needle protector forward completely covering the needle until wings are secured with an audible or tactile "click". Dispose of Safe Touch Tulip in an approved biohazard sharps container .